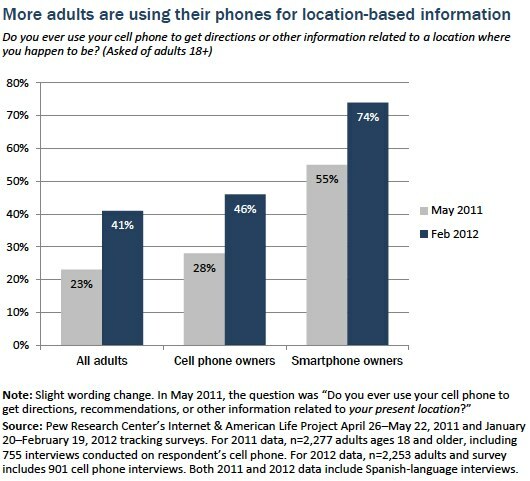 Almost three-quarters (74%) of smartphone users use their phones to get directions or recommendations based on their current location, up from 55% in May 2011. 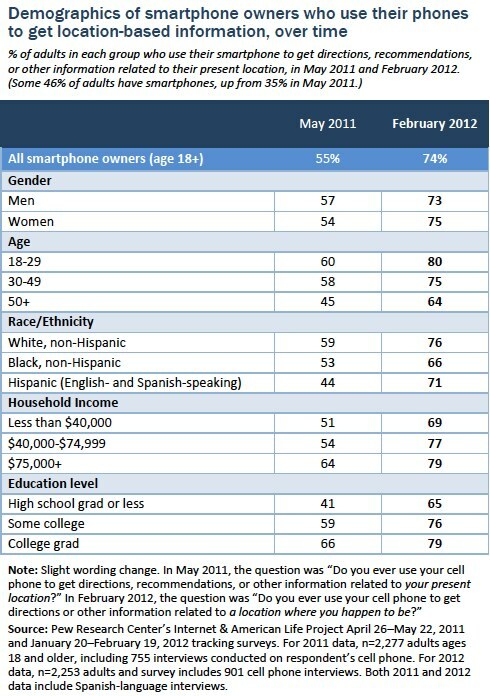 This works out to 41% of all adults (23% in May 2011). This was the second time the Pew Internet Project has asked about general location-based services, which can range from GPS-enabled map services to reviews of nearby attractions using an app or a browser. Among smartphone owners, those ages 18-49 are more likely to use location-based information services than smartphone owners age 50 and older, and whites are more likely to use these services than African Americans. Those in households making at least $40,000 per year are more likely to use location-based information services than lower-income households, and smartphone owners with at least some college experiences are more likely to than those who have not attended college. In general, these patterns of usage are very similar to what they were in May 2011, as shown in the following table.